After the turmoil of Trump in Brussels, EU leaders are in China and Japan today (16 July) and tomorrow for two important summits, a sign that Europe is looking to Asia, writes Fraser Cameron. Fraser Cameron is the director of the EU-Asia Centre and a senior advisor with Cambre Associates. In Beijing, Tusk and Juncker will meet with President Xi Jinping and Premier Li Kequiang to review the international scene as well as bilateral relations. Both the EU and China have been buffeted by the imposition of US tariffs and a sense of unease due to the unpredictable nature of President Trump. The top priority will be discussions on how to save the multilateral system. Following a recent visit by European Commission Vice-President Katainen, who will also attend the summit, the two sides have established a working group on the future of the WTO, including how to tackle the sensitive issue of industrial subsidies. China’s over-capacity in steel production remains a difficult issue. Leaders will now discuss how to take these issues forward in light of Trump’s assault on the global trading system. EU Trade Commissioner Malmstrom is another attendee and she will push for greater reciprocity and an open, predictable, fair and transparent business environment for European companies in China. It is expected that the slow-moving bilateral investment agreement negotiations will be boosted by an exchange of offers on geographical indications and market access. These moves should be welcomed at the parallel EU-China Business summit. Connectivity will also be on the agenda with leaders seeking synergies between China’s Belt and Road Initiative and the EU’s upcoming strategy on Europe Asia Connectivity. An agreement on customs cooperation is also likely. There will be a review of progress on the implementation of the Paris climate change agreement and a new agreement on emissions trading. One area where there has been considerable progress is on ocean management and an ocean partnership should be concluded at the summit. Leaders should also welcome the launching of new EU-China dialogues on drugs and humanitarian cooperation. On the foreign policy front, the agenda will cover the Iran deal, North Korea, Ukraine, Syria, Afghanistan, Myanmar and Africa. On many issues, the EU and China are in closer consort than with the US. On Tuesday, Juncker and Tusk fly on to meet Prime Minister Abe in Japan. He was supposed to visit Brussels last week but the visit was postponed because of the floods in Japan. 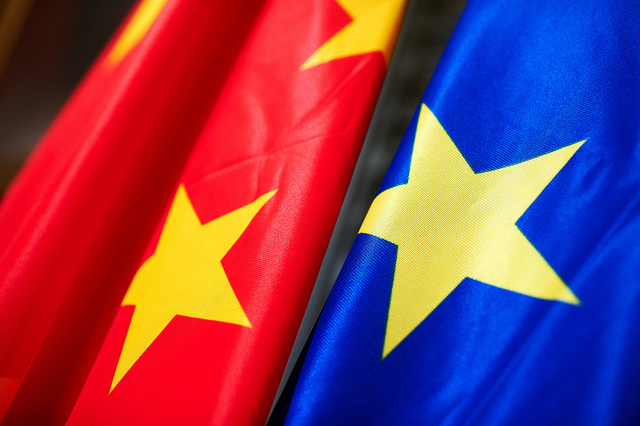 The EU leaders swiftly offered to make the short hop from Bejing to sign the momentous free trade agreement and an accompanying strategic partnership agreement. According to Juncker, this will be the biggest FTA in the past 20 years, and a clear indication of the commitment of both partners to a rules-based global trading system. It is shameful that EU is ready to make any deal with China ruled by communist dictatorship. What about EU valuse such as human rights that does not exist in China?. Next year in May we will chnage this shameful politics of Juncker, Macron , Merkel and another liberal dictators.